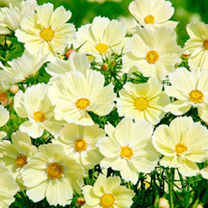 A unique new colour – soft yellow flowers on compact, bushy plants. It comes into bloom early and lasts all summer, is ideal for borders or containers, and makes a lovely cut flower too. A well deserved Fleuroselect Gold Medal winner! Height 60cm (2’). HHA - Half hardy annual. Sow April-May 6mm (¼") deep direct into finely raked, moist, warm soil where the plants are to flower and rake the seed in gently. Germination usually 7-14 days. For earlier flowering, sow February/March 3mm (1/8") deep into good quality compost and place on a windowsill or in a greenhouse at approximately 18-21°C (65-70°F) to germinate. Space seedlings to 5cm (2") apart and grow on. Plant out 8-12cm (20-30") apart in a sunny position end of May. May also be sown in early autumn for early flowering next summer. Ideal for beds and borders, patio pots and containers. Attractive to butterflies and bees. Suitable for cut flowers. Prefers full sun or partial shade. Pinch the initial growth to encourage a bushy plant habit.